On Monday Barnes & Noble provided an app store and an email program for its Nook Color eBook reader, so the $249 device is more like a multi-purpose tablet computer, particularly Apple's iPad. From the Associated Press: The Nook Color has a color touchscreen, which gives it capabilities beyond those of Amazons competing Kindle. The Kindle has a gray-scale screen which isn't touch sensitive. The Nook Color runs Google's Android software, which is used on phones and tablets, but the device doesn't run standard Android applications. Instead, B&N is encouraging developers to submit specially written applications to its Nook Apps store. Among the more than 125 applications available Monday are the game "Angry Birds" and cooking recipe vault "Epicurious." Barnes & Noble is also adding the ability to play Flash content on the Nook Color's Web browser. B&N's Jonathan Shar said the Nook isn't intended to go compete directly with full-fledged tablets such as the iPad, for which there are more than 65,000 apps. "The target for this is still people who love reading," Shar said. The bookstore chain launched the Nook Color in November as a successor to its first Nook, which had a gray-scale screen and a smaller, color one. Right from the start, the Nook Color had a few non-book applications like "Sudoku," but there was no way to add more. The new features are available as a free software update for current Nook owners. 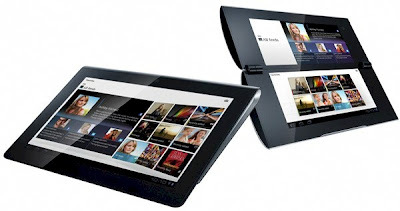 According to the AP, Sony is planning a tablet computer with a touch panel similar to the iPad for later this year that the company promises will make the best of its gadgetry and entertainment strengths. The product code-named S1, shown Tuesday in Tokyo, comes with a 9.4 inch display for enjoying online content, such as movies, music, video games and electronics books, and for online connections, including email and social networking. Sony also showed S2, a smaller device with two 5.5 inch displays that can be folded like a book. No prices were provided. Sony Senior Vice President Kunimasa Suzuki said the products will go on sale worldwide in the fall. Both run Google's Android 3.0 operating system. Suzuki said both of the latest tablets feature Sony's "saku saku," or nifty, technology that allows for smooth and quick access to online content and for getting browsers working almost instantly after a touch. "We offer what is uniquely Sony," Suzuki said after demonstrating how the S1 was designed with a tapered width for carrying around "like a magazine." The devices will connect to Sony's cloud-computing based library of content such as movies and music, as well as to Sony PlayStation video games adapted for running on Android and digital books from Sony's Reader store, the company said. Sony, which makes the Vaio personal computer and PlayStation 3 video game console, has lost some of its past glory - once symbolized in its Walkman portable music player that pioneered personal music on-the-go in the 1980s, catapulting the company into a household name around the world. It has been struggling against flashier and more efficient rivals including Apple and Samsung. Kazuo Hirai, promoted in March to head Sony's sprawling consumer products and services division, said Sony's strategy has always been about combining the benefits of hardware, software and networking to make consumers happy, and that was the same goal for S1 and S2.